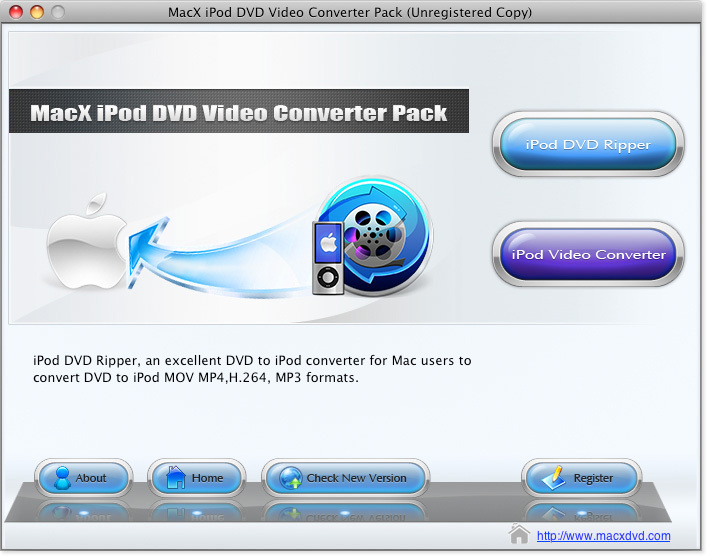 MacX iPod DVD Video Converter, combined with MacX iPod DVD Ripper and MacX iPod Video Converter, works powerfully to convert any DVD and various videos like M2TS MKV AVI, MOV, WMV, etc to iPod/Touch 5/nano/classic and Apple TV on Mac OS with high quality and fast speed. It offers a hand to convert all DVD including copy-protected DVD and all popular used videos both HD videos like MKV, M2TS, AVCHD, H.264/MPEG-4 AVC etc and SD videos AVI, MPEG, RM, RMVB, WebM, Google TV etc to iPod, MP4, MOV etc. Besides, this Mac iPod DVD video converter also features in extracting music and pictures from DVD and videos, editing video, and creating photo slideshow with great ease. The MacX iPod DVD Video Converter 4.0.3 update improves stability and also adds compatibility with Mac OS Sierra.Main Features:1. Convert any DVD, including copy-protected DVDs, to iPod Apple TV supported formats.2. Support converting both HD and SD videos to iPod, like MKV, M2TS, AVCHD, MPEG4, AVI, F4V, RM, WebM, etc.3. Convert any DVD and video to all iPod generations, including iPod nano, iPod touch 5/4, and iPod classic.4. Support converting Multi-track HD video M2TS, MKV, AVCHD, HDTV BDAV and MPEG-TS.5. Various video editing features are provided to trim video clips, merge multiple video, crop videos, add watermark or external subtitle to make your own video.6. Easily extract audio and images from DVD and video.7. Adjust video and audio parameters for customizing output setting.8. It can help to turn photos into a stunning video slideshow for viewing on iPod.9. This video converter software delivers high conversion speed and perfect outstanding output quality with the help of Multi-core CPU, hyper threading, Deinterlacing technology. Analog modeled audio enhancement. Analog modeled EQ, tube compressors and amplifiers, room simulators and more -- a lot more. 4Videosoft iPad Video Converter can help you to convert all popular video formats to other videossupported by iPad, iPod and iPhone. Besides, it can convert any popular audios or extract audio and save as iPad formats.